Take a trip around the world in one weekend! Happy Friday Angelenos! Looking for things to do in L.A.? This weekend take a trip around the world in one weekend! You’ll get to stamp your virtual passports with holidays in The Philippines, China, India, Mexico and Japan with events to stir your taste for adventure! Tonight, all I have to say about Grand Performances’ Halo-Halo Fest is that the 25% of me that’s Filipino is super ecstatic to soak in traditional and modern artists (um, Taglog hip-hop anyone?) If you haven’t caught a FREE show here, you’re truly missing out. Show starts at 8PM, bring blankets and take-out from Arko. Over in Pasadena, the Pacific Asia Museum is hosting it’s last Fusion Friday of the summer! 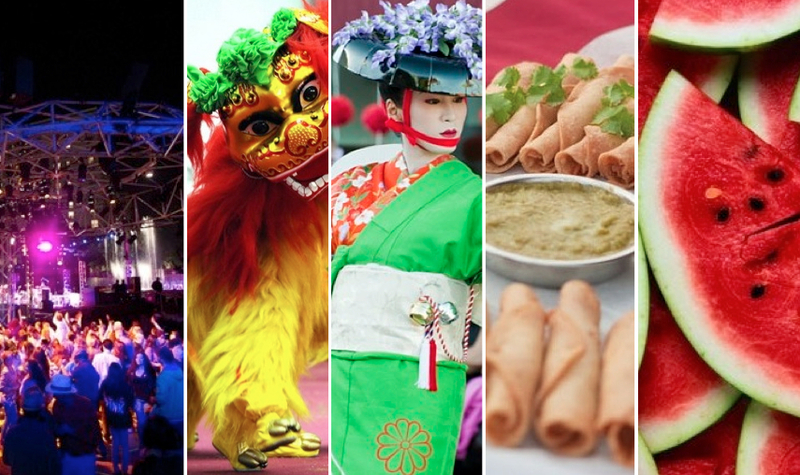 For $15, you’ll get to imbibe courtesy of Angel City Brewing, dress up and enjoy a mix of art, interactive exhibits and performances by Chinese lion dancers and DJ Jeremy Loudenbeck banging out bhangra beats from 7:30PM-10:30PM. Be sure to wear your stretchy pants on Saturday because it’s going to be a twofer. First, check out the last 2 days of Nisei Week in Little Tokyo and the World Gyoza Eating Championship at 3PM. After your fill of dumplings, head over to Boyle Heights for the L.A. Taco Festival benefiting Jovenes, Inc. Doing good never tasted so delicious! On Sunday, return to good ol’ USA for the Watermelon Festival. Held at Pasadena’s Rose Bowl, $10 gets you in to see live music, crafts, petting zoos and all the watermelon you can eat. Have a great weekend!